Wow so much delicious food now i am getting hungry LOL. love the crepe.. anything sweet, I am in! I cannot masuk facebook and lazy to sms. Can e-mail me you address or not? The millie crepe sure looks good. I've wanted to try that in Melaka the other day but did not manage. 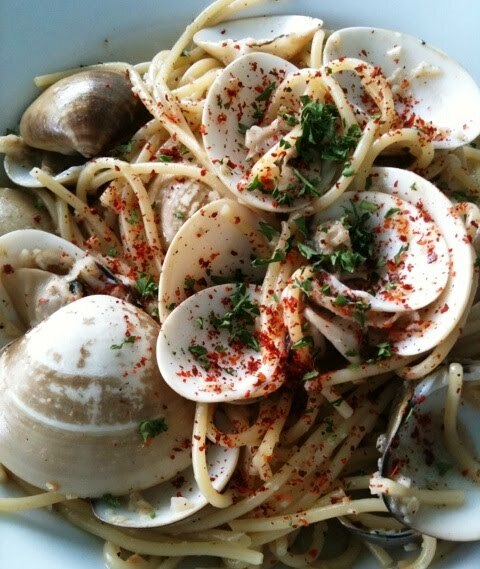 Vongole...just the clam and the pasta? Yucks.... :p So raw ler. Palatable meh? awww, now only you get the MFM voucher from witch?? Wanted to go there for the longest time to try their mille crepe. owh..the mille crepe!i am so gonna try that! Ehh how come you had two pictures of Vongole! I know, you had it for your own the next time you went! LOL! I used to like Marinara/tomato-based sauce for pasta last time but now, I'm HOOKED to aglio olio and chilli flakes! In fact, I made it so many times at home that Saucer said it's better than a lot of Italian restaurants already!!! Haha..
Yea we really talked so much until I totally forgot about the voucher!! Luckily we had another outing later at Sushi Tei. :P Haha the twitter bird is following you??? I thought it's following me! LOL! oh no! am so late! LOL! :D n i saw two pastas here!! i think is cz u love tweet so much till d bird oso thr! Pasta? I do like pasta but I seriously think Saucer's dish is more appealing...is it nice?? what a delicious spread. the cake looks absolutely divine but i can't imagine the calories.!!! Put Witchy on a Saucer, and you get a yummy meal! I am not so fond of the food at Food Foundry. I only like their mille cake. Pasta with sea foods? Is it better than the regular pasta with tomato sauce? Whoa! Witch! I visit her blog sometimes. ^_^ Wait. I gotte add her blog to my Google Reader. looks scrumptious..i sure love them! mariuca, haha! Busy watching TV so took longer to update my blog. 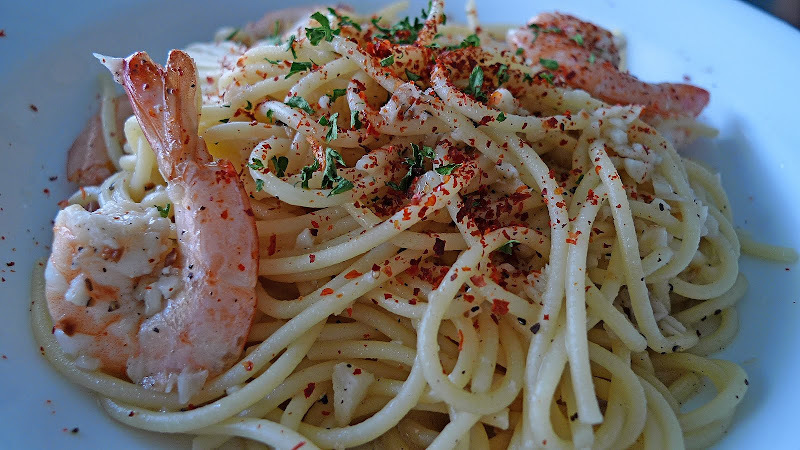 Yes, love that Aglio Olio Prawn pasta! Oh, you must try the mille crepe cake! mNhL, oh Melaka sell Mille crepes too? Which part of Melaka? 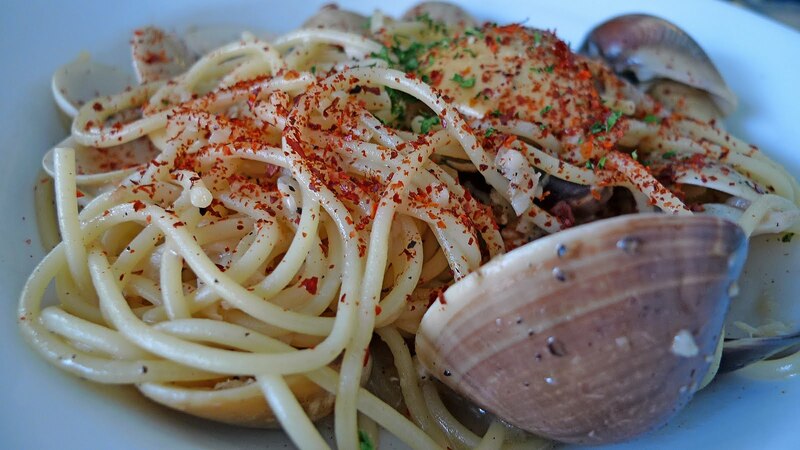 You must come try the pastas - you will love them! 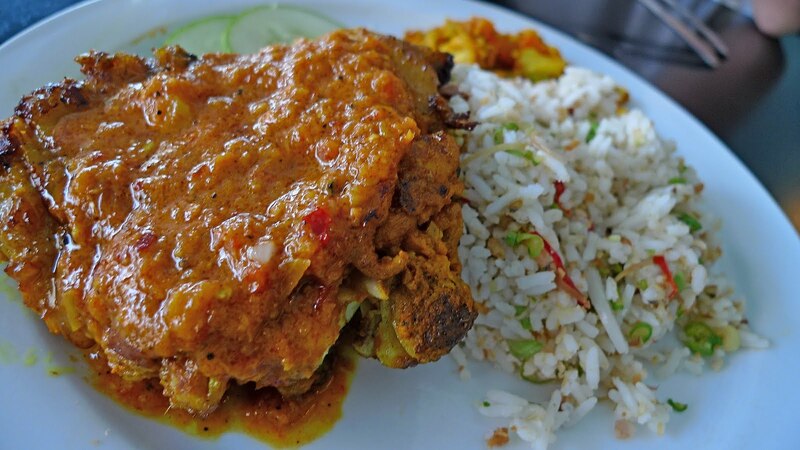 Curry chicken is nice but not so healthy. 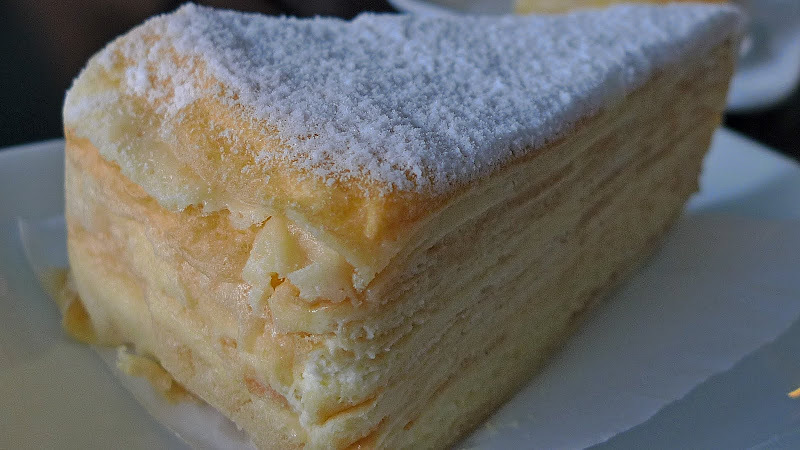 I learnt that a shop in Melaka sells Mille crepe cakes - do you know where? I am definitely not Saucer, haha!!! SK, haha! No I got the MFM voucher much earlier but now only I blog about it. LOL! I tagged you in FB to make you hungry! Haha!! che-cheh, yes, very good! You must go try! iamthewitch, haha! You are correct. I like the aglio olio pasta but I still like tomato-based pasta. Wah! I want to taste your home made pasta! life ramblings, forget about the calories and just enjoy! Haha! erika toh, keep on drooling! haha! mei teng, why you don't like the food? Yes, their mille cake is yummy!! The decoration done over the food will definitely attract everyone. I hope the food is as tasty as the decoration. Bye. yeah they are very famous for their mille crepe. I love that! 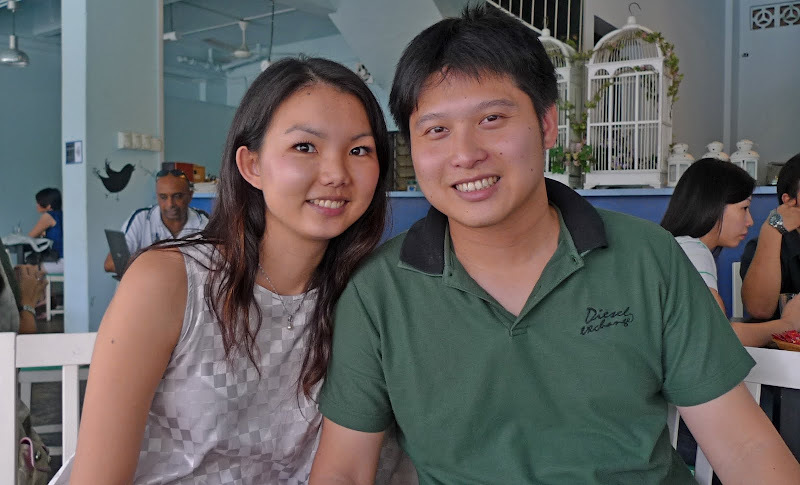 Happy couple, of course they look good! The clams are very much tempting me foong! arrrgh! I am surprised you know this place - Food Foundry as many people never heard of it. They are really cook like specialist and I love that place too. i live in PJ but i don't know where Happy Mansion is!! So the Sunday lunch went on quite nicely for you. The food were great. I'm curious to know as if why the cook served the shell along with the food. It is for decoration or other purposes.